Last week I realized I was lacking a go-to chocolate pound cake recipe, so I baked one twice. In three days. Oh, the life of a food blogger! 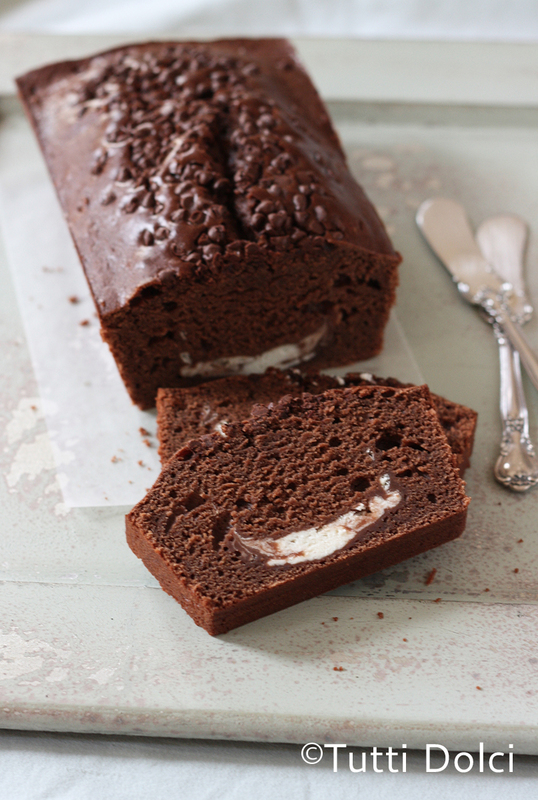 Fortunately, my chocolate pound cake is lightened up with buttermilk and Greek yogurt, yet its decadent taste (think devil’s food chocolate) will satisfy even the most devoted chocoholics. 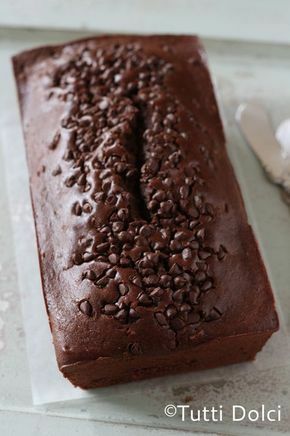 Slicing into the pound cake reveals a ribbon of tangy cream cheese that makes a nice counterpoint to the rich chocolate. A scattering of mini chocolate chips is all the adornment this cake needs. Preheat oven to 350°F and spray an 8 x 4-inch loaf pan with nonstick spray. Combine cream cheese, yogurt, sugar, and vanilla in a food processor and process until smooth. Whisk together flour, cocoa, baking powder, baking soda, and salt in a medium bowl. Beat butter and sugar in a large mixer bowl at medium speed until light and fluffy; beat in egg and vanilla. Combine yogurt and buttermilk in a small bowl. Reduce speed to low and add half of flour mixture, beating just to combine. Add yogurt mixture, then finish with remaining flour mixture. Pour half the batter into prepared pan; dollop with cream cheese mixture and swirl layers together with a knife or wooden skewer. Top with remaining batter and smooth with an offset spatula; sprinkle with chocolate chips. Bake for 55 minutes, until a toothpick inserted in the center comes out clean and cake springs back to the touch. Cool in pan on a wire rack for 10 minutes; carefully remove cake from pan and cool completely on wire rack. Store leftovers in an airtight container in the refrigerator up to 3 days. 0 Response to "CHOCOLATE POUND CAKE"